After years of time at your university, you’ve finally approached the goal: graduation. Thinking about graduating from school evokes a mix of emotions: happiness, sadness, confusion, anxiety, and sometimes even nostalgia of your days of being a carefree kid. But it’s an exciting step into the next part of your life where you can truly be independent. Make sure to do these following things so you’re ready to go after the big day to start the rest of your life! Go to your university’s career center if you haven’t already. Your school’s career center will contain a multitude of resources for you to use to get yourself ready for a job search. Most importantly, you should sit down with an advisor and create a resume that is professional and tailored to your academic skills. You could even create multiple resumes to highlight different areas of talents, such as different degrees or subject matter. You should also use this time to create some cover letters, as they are also an important part of the job application process. This is also a good time to get advice on how to do an efficient job search. Your advisor will give you websites to look at to start applying for jobs that suit you. Usually, as a student, you can create special accounts on websites that may make the search easier. The center can also give additional information, such as when there are visiting employers looking to recruit. They could also provide other resources, like providing mock interviews or giving you names of faculty to consult for additional information. This may seem really daunting to think about. If you’re not going back to live with parents (which is a totally fine thing to do, by the way, if your parents are okay with it), you’re going to have to find your own place to live in. Look at your future city’s apartments to get an idea of what to expect and what the average price for a room is. You can check roommates.com to search for roommates to save on rent. Make sure you have enough money to pay a few month’s rent, especially if you don’t have a job lined up. You never know what may happen and the last thing you would want to happen is to be homeless due to being short-sighted. The last year, and especially the last semester, of school is one that is spent by most students in a celebratory fashion: parties, get-togethers, and trips are quite common. But even through all that, make sure you’re putting aside some money, so you have a cushion after graduation. Having one or two thousand dollars as reserve money is a good start. This will ensure that you aren’t living paycheck to paycheck, and/or have some reserve money if you don’t have a job yet. If you are planning to apply for post-secondary education, make sure you have all your application materials set. 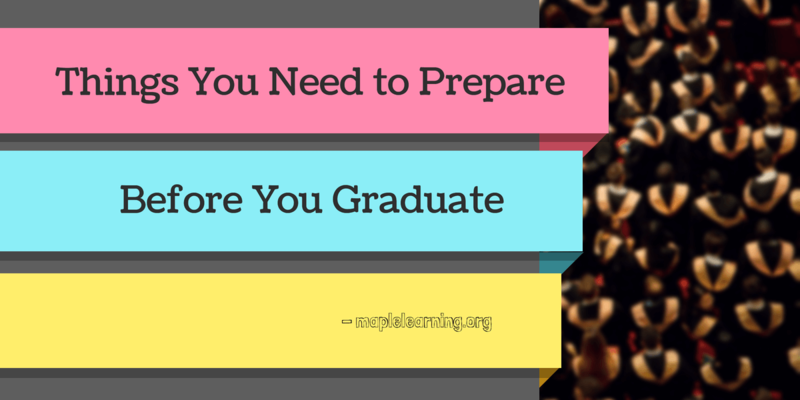 If you are planning to apply for a Master’s or a professional school, ensure that you have your materials together and that you have all the deadlines correct. Make a list of every school that you are considering, and highlight all the application materials they are asking for, such as transcripts, recommendations, and essays. If you need to take a test, such as the GRE, LSAT, etc., make sure to register for a date as soon as possible so you won’t get locked out of submitting them on time. For recommendations, make sure you ask your professors early; consider asking about 3 weeks earlier than when you need it so they have plenty of time to work on it. After all, professors are busy people and it will only work in your favor if you give them plenty of time to work on it. Make sure to have the correct number of recommendations for each school, so you aren’t short when the due date rolls around. Figure out your student loans. Talk to your financial advisor and/or your student loan provider and ensure that your account is clear for after you graduate. You may have different particulars to consider depending on each type of loan, such as interest and amount to pay per month, so have those cleared before you graduate. Defaulting on your student loans right when you start your new life isn’t ideal, so make sure to stay on top of them. And finally, have fun! You came very far and worked very hard, so make sure to relax and celebrate.